I love the smell of fresh Christmas trees. I have been spending some time at our condominium in Ohio and we are not allowed to have to have a real Christmas tree in this high rise building. This means I am decorating for Christmas without a tree. But since it is my third December in this condo I have it all worked out so I can have the wonderful smell of fresh Christmas greens. Come along for a tour of my modern condominium which has been decked out with evergreen boughs in almost every room! Last year was the second year I was decorating this place for Christmas and I learned from the first December here I did not care much for glitzy and modern Christmas decor. For some reason I thought I needed to keep the decor all modern instead of softening the look for the holiday. Now I know more traditional is my Christmas style, even in my modern condo. In the photo above you’ll see I took a huge silver aluminum pedestal bowl and filled it with a variety of greens, some artificial red berries and lots of red velvet ribbons. To finish it off I added babies breath which to me looks like little snowflakes. I am only hosting cocktail parties here for the holidays, so this won’t have to be moved from the table throughout the season. 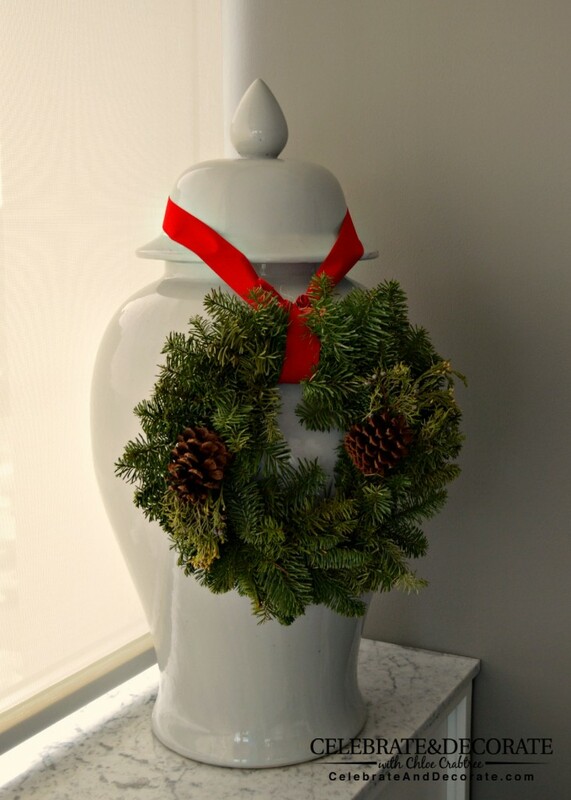 A tiny noble fir wreath was perfect for adding to this oversized white ginger jar. Tying it on with a pretty red velvet ribbon says Christmas. A couple of little dog figurines have been treated to red ribbons and a sprig of cedar and turned to give one another a Christmas kiss. I used this silver Champagne bucket to make a large statement arrangement. The abundance of the greens here are so very fragrant when I walk in from the front door. By adding some artificial red berries I get a little pop of red and the babies breath reminds adds a nice contrast against the greens. 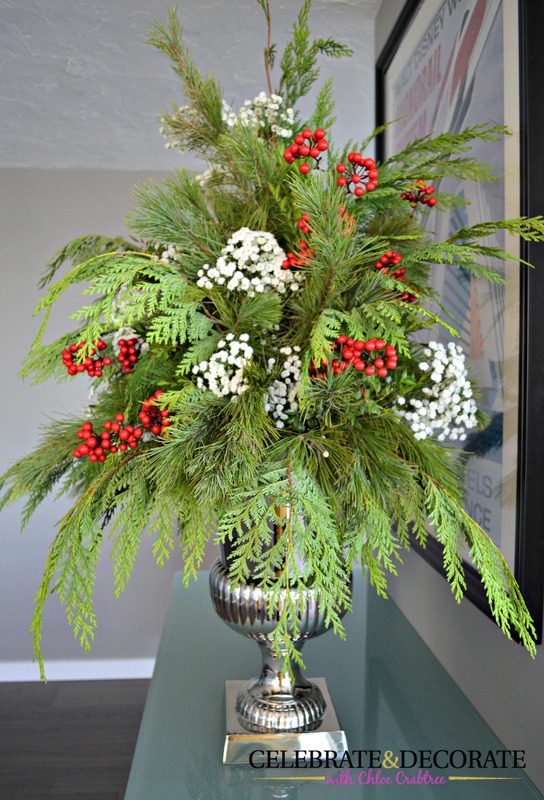 Even my guest room received a little vase of evergreens trimmed out with red ribbons. I had three little pots of anthurium for at least six weeks on a table in the living room, but they were starting to fade, so I cut off the best blooms and added them to this arrangement for a little more pop of the red. The guest room bed also got a couple of little Christmas pillows added to it for the season. 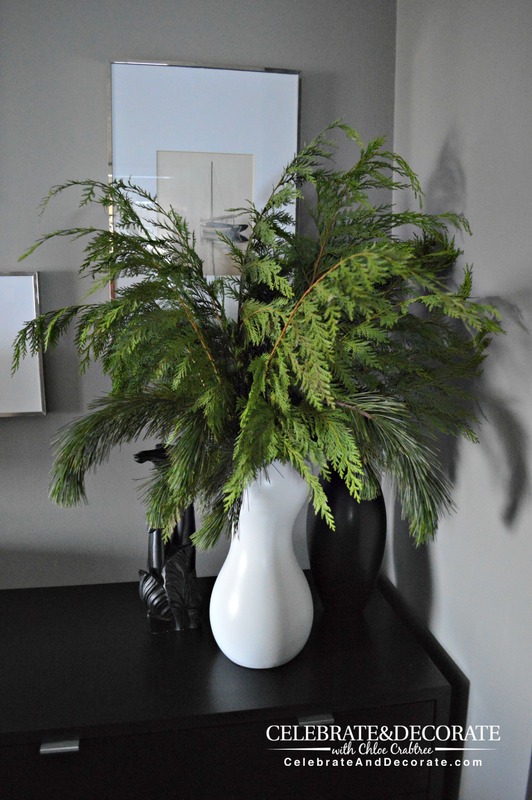 It is so wonderful to wake up in our master bedroom to the heavenly scent of the fresh Christmas greens arranged in this modern white vase. The lush cedar is so pretty and smells so good. 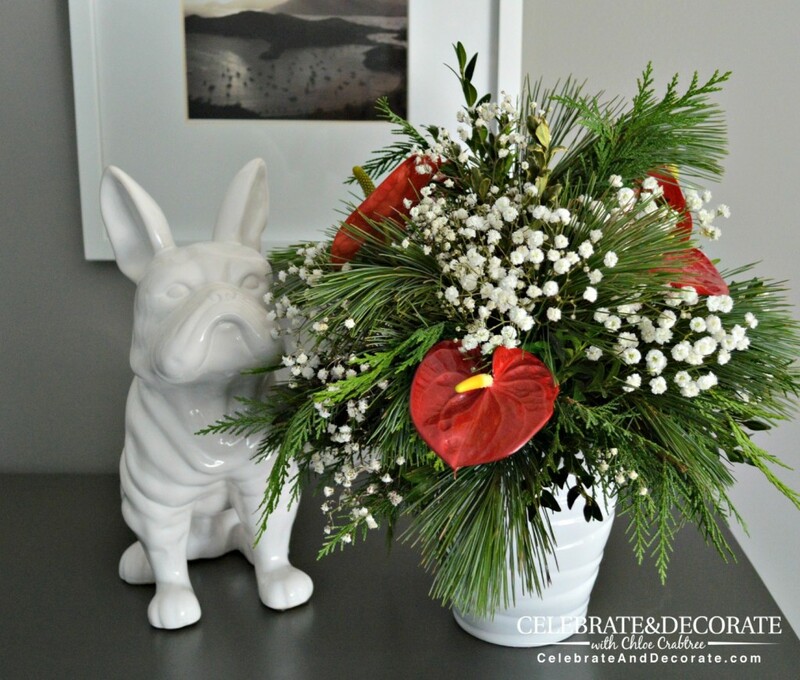 You can always add fresh flowers to your evergreen arrangements, but even if you just have greenery, make sure you add water every day, these greens drink quite a bit, just like a tree does. 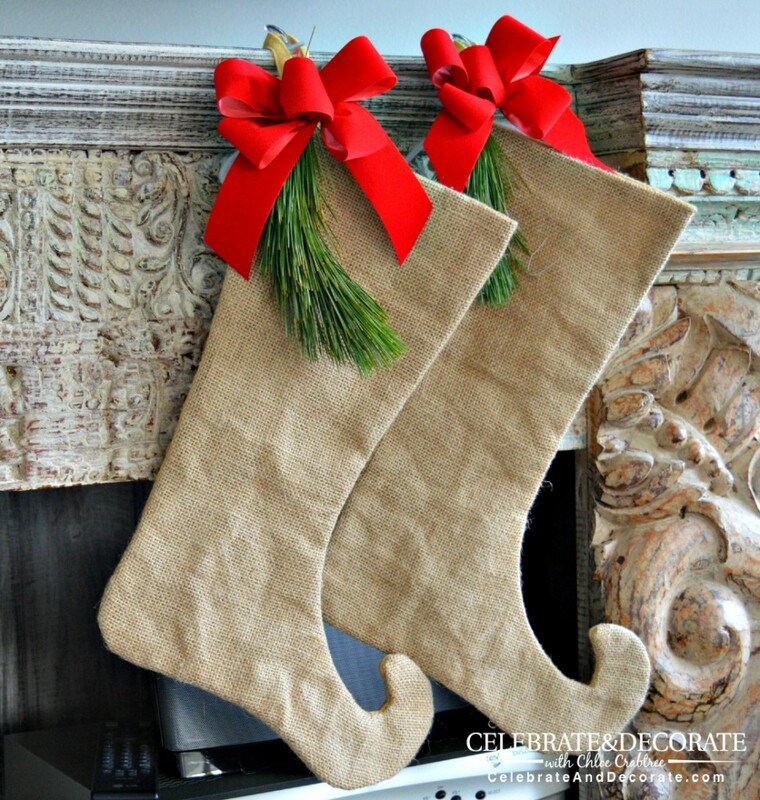 Even a little bit of pine attached with a red ribbon to these burlap stockings gave them a little bit of a “pop” of Christmas color. I will be back in Florida for Christmas, but perhaps Santa will leave a little something in these stockings. Do you put up a Christmas tree? 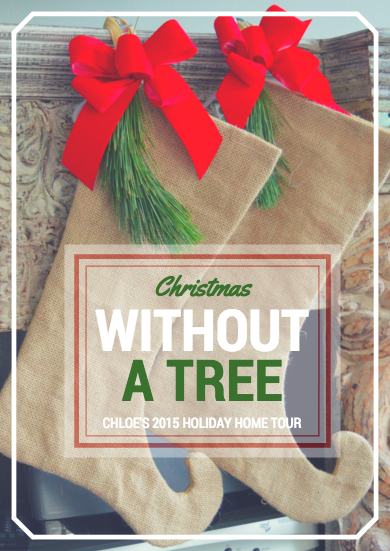 Is your tree artificial or real? Let me know in the comments below! Everything here is so festive and inviting! It takes all I have to keep up with one place, you’re doing an excellent job with two! Oh, Sandra, I am totally overwhelmed with two places! Yesterday, however, I told myself to stop complaining about too much to do and got to work and got so much accomplished! Thank you for your compliments! I love the smell of the fresh greens. So beautiful Chloe! 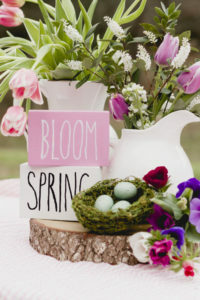 You have a knack for putting floral arrangements together. I’m beginning to prefer this way of decorating with fresh greens and having less stuff to store. 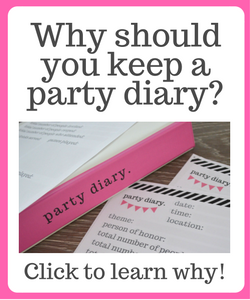 I always say I’m going to keep things simple and then I wind up putting it all out every year. FYI- love that antler chandelier! Thank you Dawn. I just love the fragrance of fresh greens! 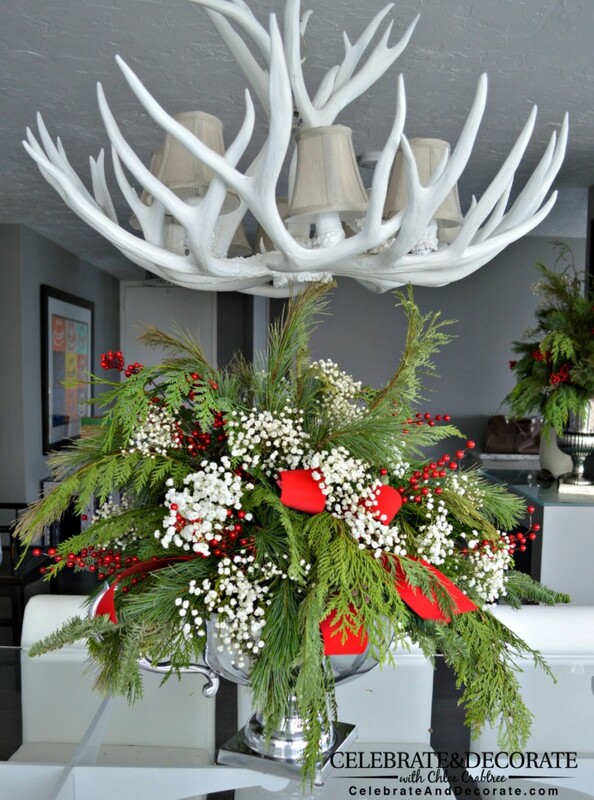 The antler chandelier is from our past large home up North. It is actually slated to be replaced. I am not sure what I will be doing with it, perhaps it needs to move to Kansas City? 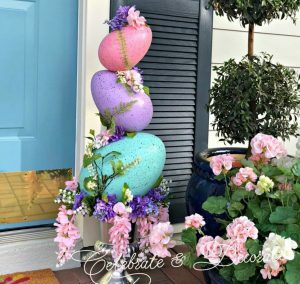 I love how you added special touches, it all looks wonderful. I am also loving your condo and how modern it is. I am off to see if I can find more pictures of it. 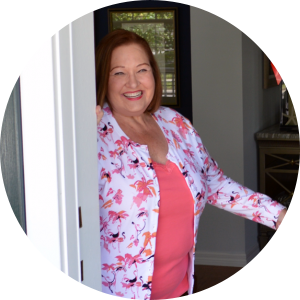 Thanks Christine, I am so lucky to have a modern place and a traditional place! Merry Christmas to you! Oh, thank you Cynthia, I am blessed! so lovely! I have told hubby when we retire and it’s just us there will be a table top tree- no more huge monstrosities! now I have a good example to show how the house can still look festive! I’m just now seeing this post. It all looks so festive! 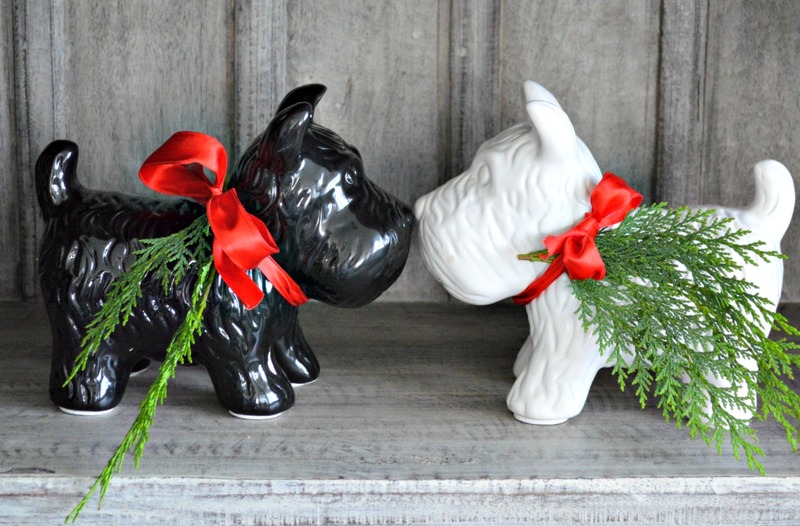 Please tell me where you found your Scottie dogs. Thank you so much for your time! I found them at my grocery store in Ohio which was Giant Eagle. You can buy them online or I see World Market also carries them!